HD 189733Ab with its parent star peeking above its top edge. Image credit: NASA/ESA. HD 189733 A is a comparatively nearby Sun-like star in the constellation Vulpecula that is orbited by a planet slightly more massive than Jupiter. 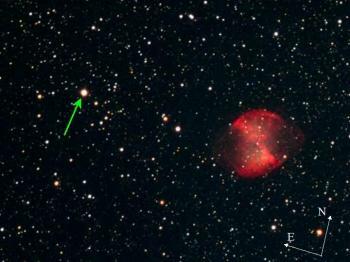 HD 189773 A lies just 0.3° east of the Dumbbell Nebula (M27) and can easily be seen through binoculars. HD 189773 A's companion planet (HD 189773 Ab), discovered in 2005, became the first extrasolar world to have its surface temperature accurately determined. Researchers led by Drake Deming from NASA's Goddard Space Flight Center used heat-sensing infrared instruments aboard the Spitzer Space Telescope to image the star with the planet at its side and then again with the planet hidden behind it. By subtracting one from the other, the team was able to distinguish the planet's heat from that of its star. They recorded a temperature for HD 189733 Ab of 844°C (1117 K) – a high value as expected because of the planet's very small orbit. In 2007, spectroscopic measurements obtained using Spitzer revealed the presence of water vapor in the atmosphere of HD 189733 Ab. This discovery confirmed what some theorists had predicted that "hot Jupiters," such as HD 189733 Ab, are "wet". 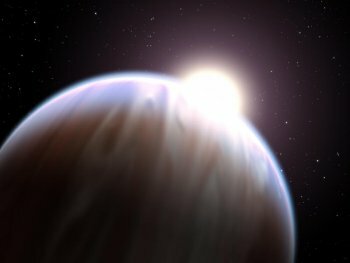 Although the water on HD 189733b is too hot to condense into clouds, previous observations of the planet from Spitzer and other ground and space-based telescopes suggest that it might have dry clouds, along with high winds and a hot, sun-facing side that is warmer than its dark side. The discovery also suggests that water – an essential ingredient of life as we know it – occurs commonly on planets throughout the universe. In 2008, researchers found methane in the atmosphere of HD189733 Ab – the first detection ever of an organic molecule in the atmosphere of an extrasolar world. HD 189773 Ab has the largest photometric transit depth of any so far observed; when it passes in front of its host star it results in a reduction of the amount of light received by 3%. HD 189773A has a red dwarf companion, HD 189733 B. The two stars orbit around their common center of gravity at a mean distance of about 216 AU every 3,200 years. Position R.A. 20h 00m 43.71s; Dec. +22° 42' 39.1"